Low-e is standard clear glass which has a special coating on one surface of the glass. Low-e refers to low emissivity and this describes the capacity of a surface to radiate heat. Emissivity is measured across a scale from 0 to 1 with 1 representing the highest emissivity. The low-e coating is spectrally selective, which means it affects some wave lengths of light but not others. Long wave infrared is the heat produced by our bodies, heaters and the furnishings in a warm room. The transmission of long wave infrared is significantly reduced by the low-e coating. It reflects the amount of energy escaping through the glass keeping the room warmer and reducing the amount of heat required to be generated by the artificial heaters. The energy from the sun is called short wave infrared; a high proportion of energy from the sun will be transmitted straight through the glass. Low-e coatings provide various performance levels and the glass can be used in a variety of ways including single glazing, laminated glass or double glazed windows. Low-e glass can reduce the amount of heat that is conducted through the glass by around 30% compared to ordinary glass. Low-e glass further improves thermal efficiency by cutting glare and preventing damage interior furnishing caused by ultra-violet rays. Newer generation low-e often uses laminated and toned glass combinations to provide superior performance over non coated glass. 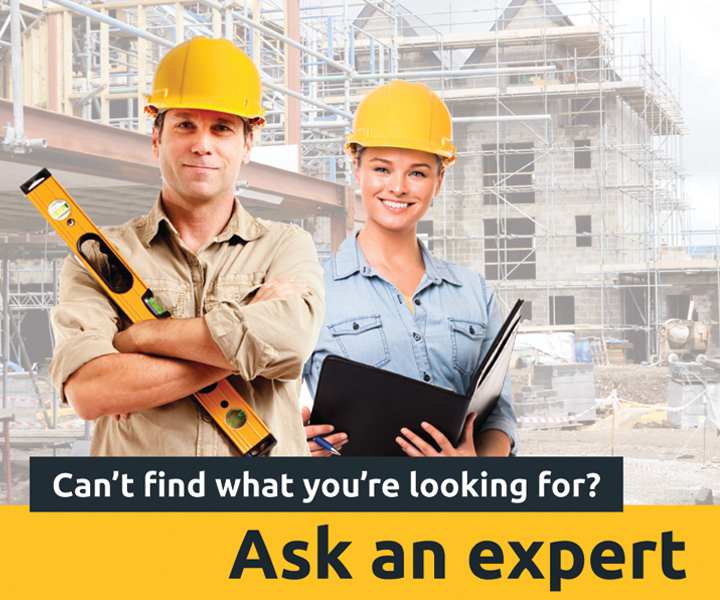 The most comprehensive solution is found by combining a low-e coating with double glazing. Using low-e coating and a suitable frame can stop up to 70% of heat loss and 77% of heat gain when compared to standard 3mm glass. 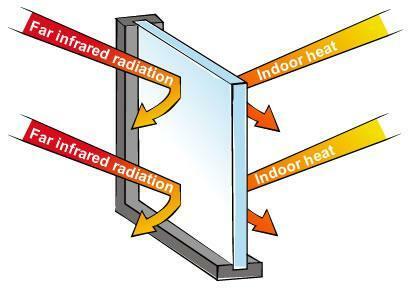 The lower the emissivity value of the glass, the less heat absorbed and re-radiated through to the colder side. 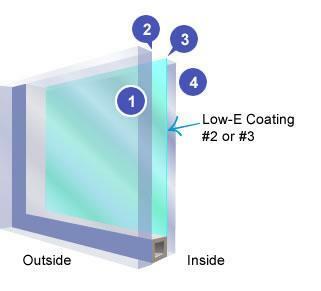 There are two types of low-e glass: hard coat (online) or soft coat (offline). Hard coat low-e glass is made by coating the glass during production with a thin metallic oxide layer, effectively welding it to the glass surface. Soft coat low-e glass, or sputter coating, is applied to glass that has already been formed. The glass enters a vacuum chamber filled with an inert gas which is electrically charged. The electricity combined with the vacuum allows molecules of metal to sputter onto the glass. This process provides the highest level of performance and a nearly invisible coating. Hard coat low-e glass is the more common variety. It is durable and difficult to scratch, and can be used for single-glazed applications. On the down side, it has higher U-values compared to soft coat low-e glass, and slightly higher haze levels. Soft coat low-e glass, on the other hand, is less common, and allows more visible light in with less visible haze. Its ultra-low emissivity also gives excellent U-values. The down side of soft coat low-e glass is that it must be used in double glazed windows, and that there can be slight colour variations. Soft coat is less durable than hard coat. Glass surfaces are conventionally numbered, starting at the outside, with surface #1. The effectiveness of low-e glass is dependent on the direction the coating is facing. For single pane windows it is recommended the low-e coating is always placed on the inside facing surface. Low-e coatings are sensitive to weather and pollutants making it difficult to clean without damaging the surface. In double glazed windows low-e glass can be specified on a particular side of the glass depending on what you want to achieve. For warm climates where summer heat reduction is a priority, the coating should be on the inside facing surface of the outside pane (surface #2). This will minimise heat coming into the home by absorbing solar radiation and reflecting it back outside. In cold climates where retention of heat is a priority, the coating works best by facing outwards on the inside pane (surface #3). The coating will work by absorbing inside heat and reradiating it back into the room. Low-e glass reduces solar gain in winter as well as summer. For this reason it is not recommended for solar control in colder climates when the winter sun provides valuable natural heating. It is more beneficial to use low-e glass with double glazing to only reduce winter heat loss.